If I remember correctly, the first time I met Mike Layton it was March of 2006; he was giving a presentation at the Mountaineers in Seattle about some first ascents he'd made in the Cascades and it featured some hilarious animations of sheep with blood gushing from their asses. It was a memorable evening with an impromptu after-party at the condo of my girlfriend at the time, who was away in Patagonia. The next day I was quite hungover from lots of Patron and too many strong beers but Ross and I persevered and skied the Northwest Face of Mount Formidable in a push. But I digress. Fast forward five years and we've both escaped the oppressive gray weather. 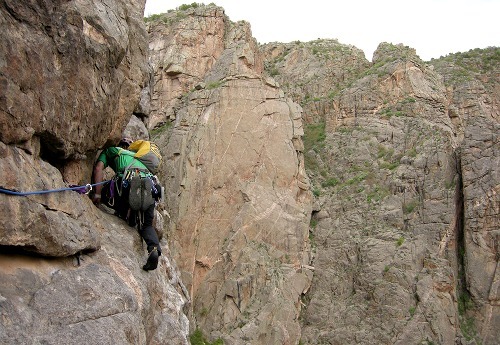 Black Canyon is almost equidistant between him in Salt Lake City and me in Los Alamos. He suggested Scenic Cruise and I could only respond like the Team America theme song. After a late arrival, a bit of swilling and a very late start, here's Mike on the first pitch. It starts with a good bit of runout mid-5th. If you can't wrap your head around that, it probably isn't the route for you anyway. I led the second pitch and began my mental acclimation when some massive stacked flakes made me contemplate my death for a minute. In the end, they were very solid. Mike kindly let me lead the next pitch too, the first pitch where Scenic Cruise splits from The Cruise, because he'd led it on a previous attempt. My mental acclimation was completed by this pitch, which traverses a face, ascends manky rock to a roof, then pulls the roof to a steep splitter. I placed a piece every body length below the roof, not really feeling good about any of them. I was happy that the climbing was relatively easy through that section. Mike on the splitter above the roof of the first pitch of Scenic Cruise. 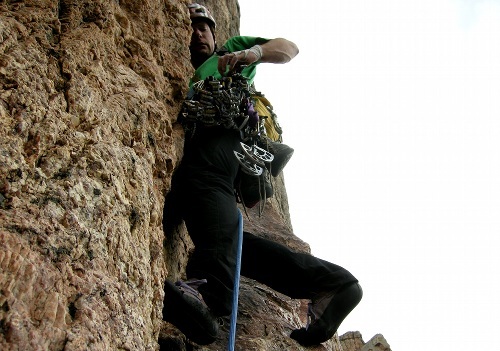 The next pitch has an awkward crux start then climbs a steep finger and hand crack. Mike rides the horse on the awkward start. Our lead-swapping gifted me the money pitch of Scenic Cruise. 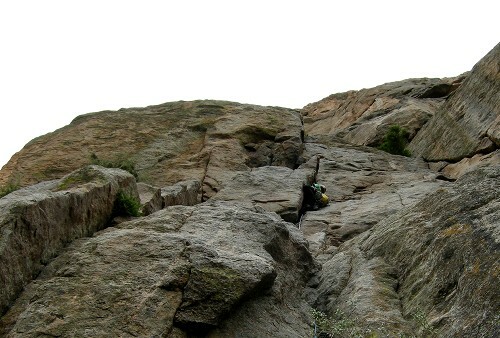 It's a long strenuous crack that features all kind of fun including fingers, hands and plenty of other good stuff. Mike at the fingery beginning. 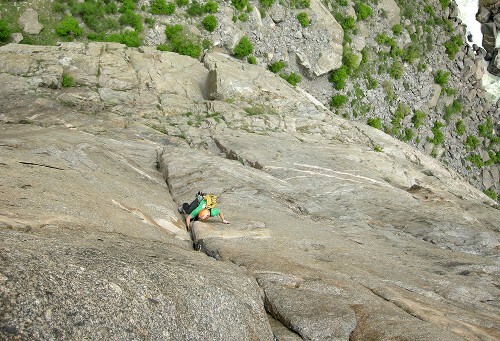 The pitch ends with a funky exit move into the pegmatite. 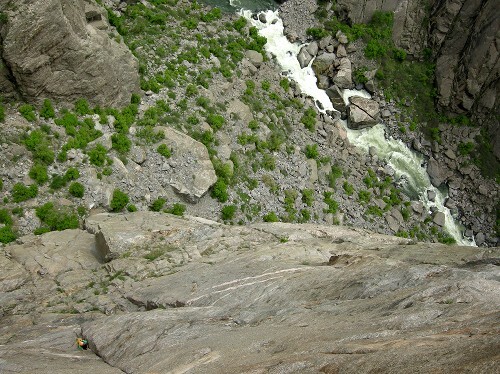 The pegmatite traverse follows. This features some funky up-and-down-and-across maneuvering, which is probably quite thought-provoking on lead. Mike cruised it to rejoin the original line of The Cruise. 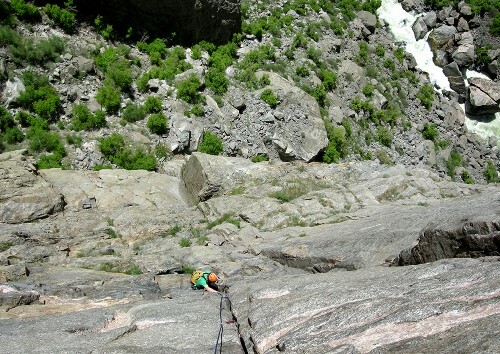 The lead that rejoins The Cruise traverses into a steep, strenuous corner where the rock quality suffers a little bit. I imagine it was much worse "back in the day" but now it's pretty good despite appearances. This pitch got into my head for a second. 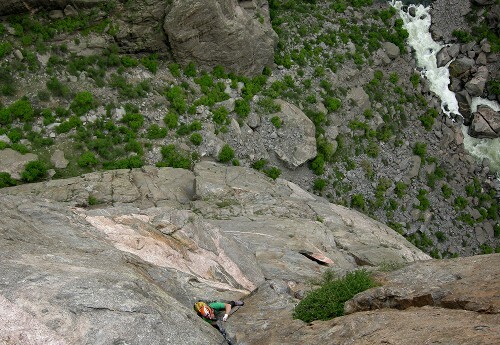 I finally reached a ledge below an offwidth without any gear to make a belay there, so I made a bonus gear-free thrutch up the offwidth to another good spot where I could get gear. Fun fun fun. 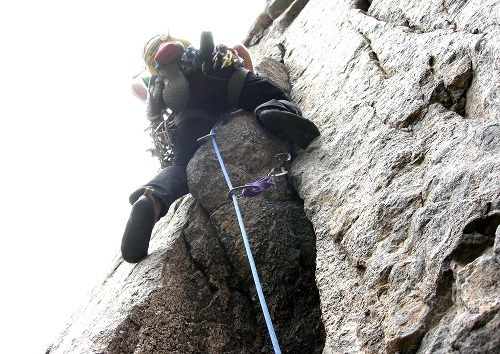 Mike follows a splitter between the overhanging corner and the offwidth. At this point, we were definitely past the technical cruxes but far from finished. Mike for the 8th lead. There is a fantastic chimney pitch. One can't help but smile after that. 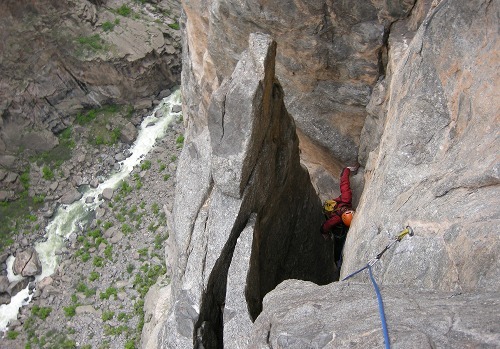 Mike drew an interesting lead on a traverse to some face climbing for our 10th pitch. There were three more pitches of mostly stellar climbing with a spot of manky routefinding, then a short ledge-walk to a viewpoint and beers at the car. It was getting late but we didn't need our headlamps. What a place! We kept it Casually Off Route for day two. Killer! I've always wanted to climb there! 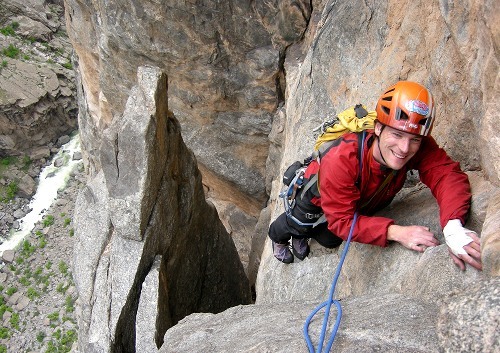 I'd be psyched to climb there with you, Pete. There is so much rock. 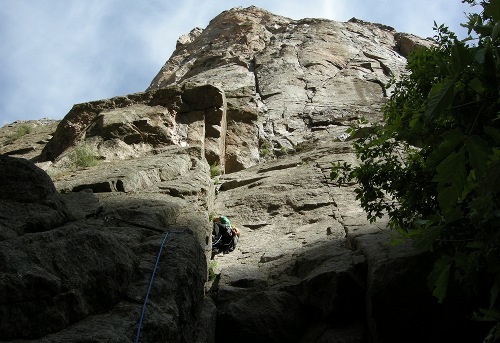 nice climbing, Mike and Sky. Sweet climbing. 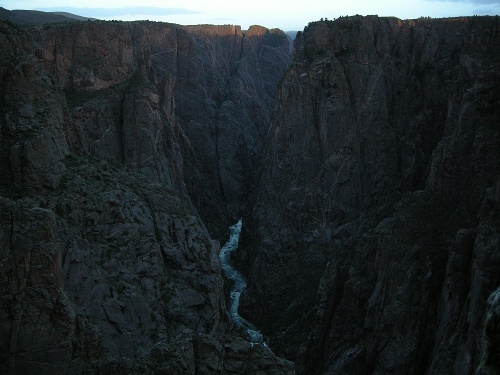 I like the history of the Black Canyon. Seems like it's still a ground up, minimal bolt, wilderness climbing area. Not that I mind bolts! Did you get thirsty? I hear people get thirsty there. let's climb soon. I'll be back in Utah about two weeks. I actually bought and took a Camelbak and drank almost all three liters. So I never felt too thirsty but I drank a lot (for me). I never have carried that much water but it seemed like a good thing. I am shocked too at the three litre, but I'm all for lots of water. That chimney pitch looks SWEET!